If you love the garden and your plants, there’s a good chance you will want to get going in the garden as early as possible. Greenhouses are great for germinating seeds, bringing on seedlings or cuttings or just over wintering your tender plants. Greenhouses will protect your plants from harsh weather in the spring but if your plants require a minimum temperature of between 4°c and 10°c, then you will need to provide them with a little extra heat. There are many factors which might influence your choice when purchasing a greenhouse heater, for example cost, fuel and safety. I have put together a list of the most common types of heaters for greenhouses, which should enable you to find the right heater for you. The main forms of fuel for greenhouse heaters are gas, electric and paraffin. Heat sink greenhouse heating systems are a project in themselves, so I will cover them in a separate post. By far the most popular heaters are electric fan heaters. They are safe and you can leave them to get on with the job of protecting your greenhouse with very little intervention. However, there is a small matter of supplying your greenhouse with power. Personally, I think supplying your greenhouse with power is a worthwhile investment. There is nothing better than spending a couple of hours pottering in the greenhouse, cranking up the heat a little, switching on the greenhouse light and listening to the radio playing in the background, not to mention being able to plug in your heated propagator! Frost protection greenhouse heaters differ from normal house fan heaters in that they are IPX4 safety rated. This is a safety coding system, where the unit has been tested for it’s level of protection against liquids. The heaters have built in thermostats, this means they can be set to come on when the temperature in your greenhouse drops below a certain temperature. For example; There is a danger of frost at about 4°c, so if you set the thermostat to frost protection it will switch itself on when the temperature in your greenhouse reaches 4°c, once the temperature starts to rise in the greenhouse the fan heater will switch itself off and as it falls again it will switch back on. This makes the heater very efficient. The other advantage of using these electric greenhouse fan heaters is their ability to move the air around the area. The air in greenhouses can become quite stale especially if they are well insulated. This stale air can lead to mould and diseases, not what you want around your precious plants. 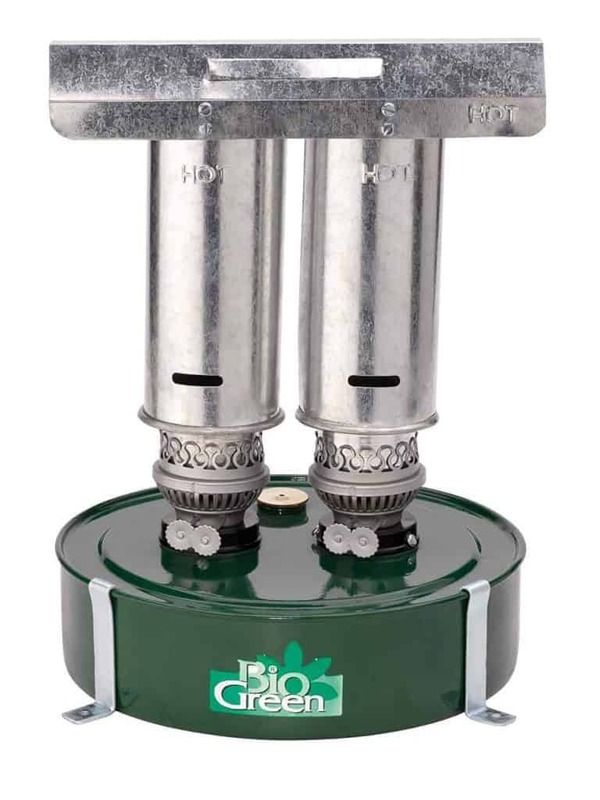 These extremely safe greenhouse heaters are usually IP55 safety rated, which means they have no moving parts and they are usually sealed so they have a greater protection against liquids. There is one disadvantage, they only heat the immediate area surrounding the heater. This means you could end up with cold spots in your greenhouse and the plants not getting the required protection from the falling temperatures. 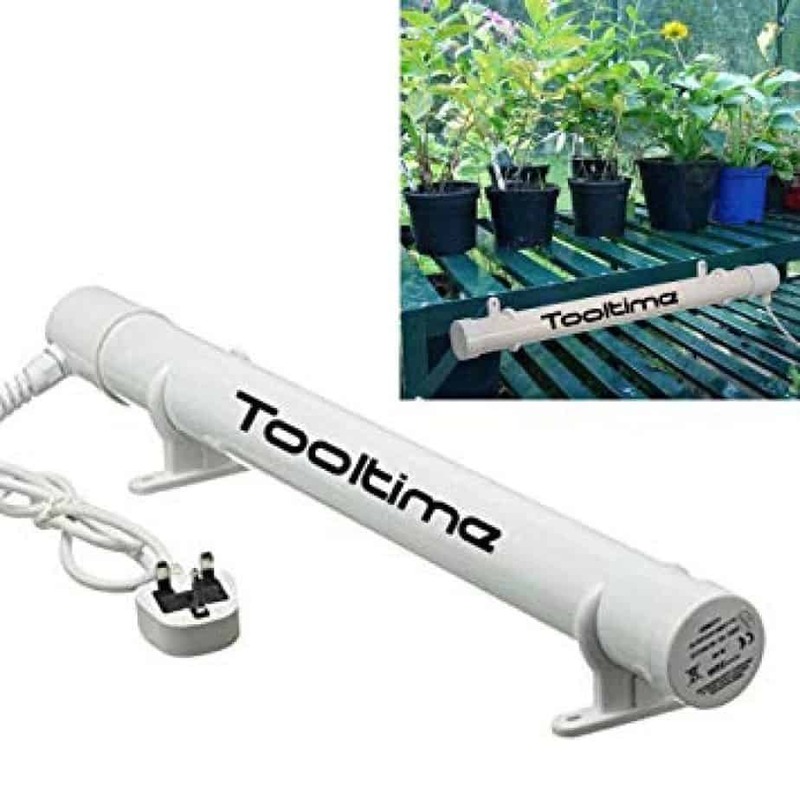 That said, if you have a small area of plants you wish to protect, on a bench for example, these tube heaters could be an efficient choice as they are cheap to buy and run. Gas and paraffin heaters are my least favourite choices for greenhouses, for two good reasons, the lack of heat control and refuelling. 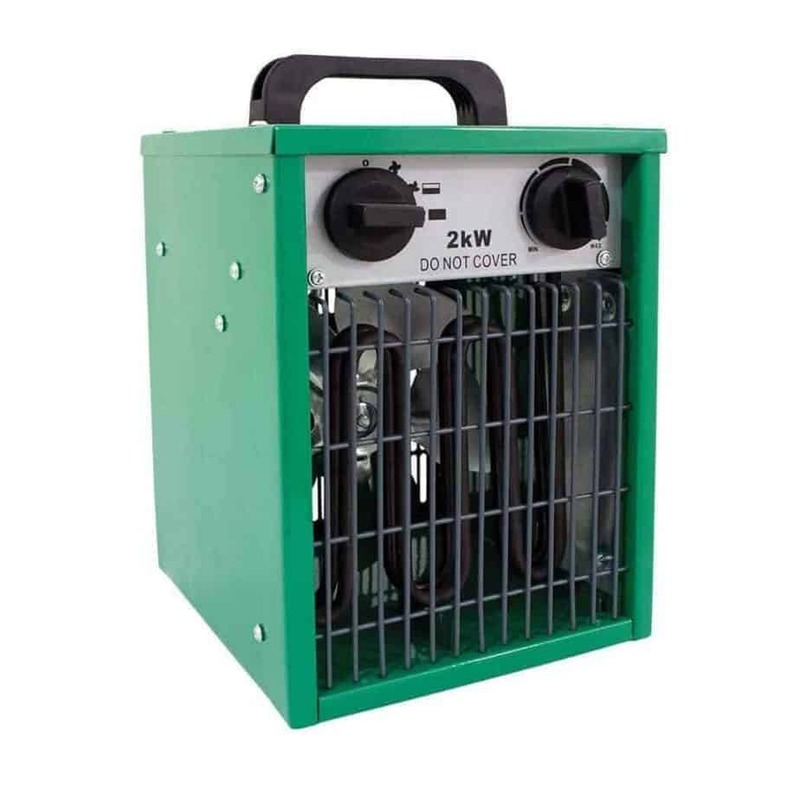 However, if these heaters are your only choice because you are unable to run electricity to your greenhouse then don’t be discouraged, they will definitely protect your plants from the cold and you can easily keep an eye on the cost. Paraffin heaters rely on a reservoir of fuel and a wick which burns the absorbed paraffin. They will typically burn for up to 80 hours but there is no particular adjustment, so once you light it, it will continue to burn the fuel even if the temperature is 10°c (perhaps during the day). Constant protection but thoroughly inefficient! Although not a huge problem, keeping the reservoir topped up is a very important job. Sod’s Law dictates that on the coldest night the paraffin reservoir will run dry! This could put your tender plants at serious risk. Gas greenhouse heaters are a viable solution. However, you could face similar challenges as with the paraffin heaters, ensuring there is enough gas to run the heater. There is no way of measuring how much gas you have left in the canister. How many times have we lit the gas BBQ in the summer only to get half way through cooking our burgers and there’s a final “pop” as the last of the gas disappears! Gas greenhouse heaters do have one advantage over paraffin heaters, they can be thermostatically controlled. There is a pilot light which stays lit all the time, when the temperature drops the heater kicks into action and blasts out the heat. The difference between these heaters and electric thermostatically controlled greenhouse fan heaters is, there is no fan to push the heat away from the gas unit. This is overcome by having a thermostat probe which can be placed away from the unit in the hope that the heater doesn’t switch off too early, leaving cold spots in the greenhouse. Both gas and paraffin greenhouse heaters suffer from a smell of their respective fuel, paraffin more than gas. If you don’t plan to spend too much time in your greenhouse this shouldn’t be too much of a problem. One last point I think is important to make, both paraffin and gas greenhouse heaters produce copious amounts of moisture as they burn. This unfortunate by-product of burning these particular fuels can cause excess condensation on the glass of the greenhouse, so expect quite a warm damp atmosphere which could encourage mould to grow and disease to multiply. The cost of heating a greenhouse is difficult to quantify with all the heating units available. I use an energy consumption plug monitor on my electric greenhouse heater. These great little devices can be plugged into a power socket and then the heater plugged into the monitor. 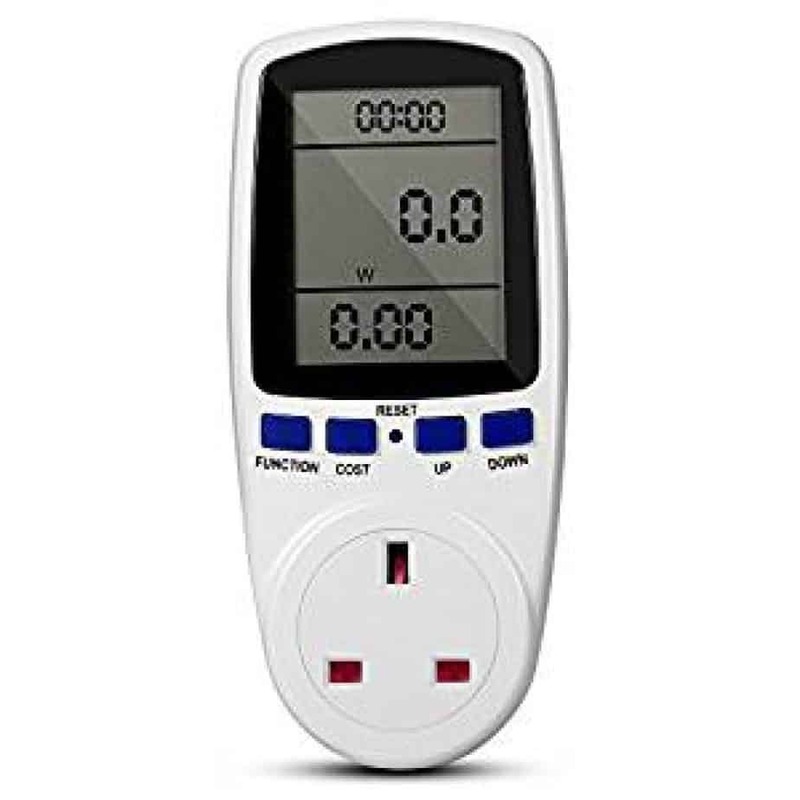 They have a digital screen which enables you to enter a price per unit of electricity (available pence/KW on your energy bill) and will display a running total. 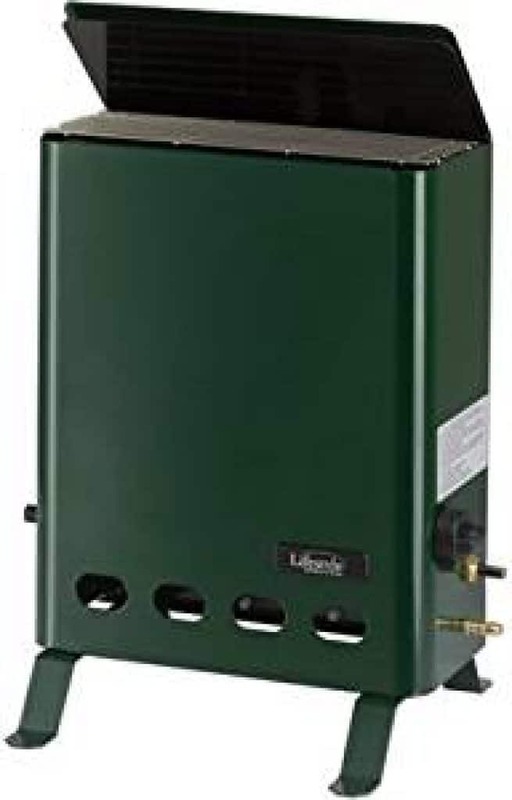 I found this device invaluable, it took the worry out of run away bills and I was pleasantly surprised how little electric the greenhouse heater used. The heater clicked on and off in the coldest part of the night usually between 11pm and 5am. I found it didn’t take long for the greenhouse to become warm enough before the heater clicked off. Gas greenhouse heaters could use approximately a 6kg propane gas canister every 10 days. Greenhouse insulation is a must if you can stretch to the extra cost. It will save you ££’s in heating bills and could cost you as little as £20 to insulate a 10′ x 8′ greenhouse. The most common form of insulation for greenhouses is bubble plastic and it is incredibly effective. Greenhouses are usually manufactured with a track which take clips that hold the bubble plastic away from the glass, effectively creating secondary glazing. Creating a flap which folds over the doorway can stop cold getting in and more importantly the heat escaping. Greenhouses are great places to while away the hours, so why not make them that little bit more comfortable. With the added bonus of getting the gardening season started early! Washers help avoid tearing of the insulation material and give a firmer grip inside the glazing bars. Greenhouse extenders work great for keeping a gap between bubble wrap and glass or plastic. 500mm x 50m large bubble wrap roll ideal for wrapping bulky and fragile items. It is manufactured using large bubbles and this doubles the amount of protection to products. This roll is flexible and so can be shaped to meet various specifications of items. 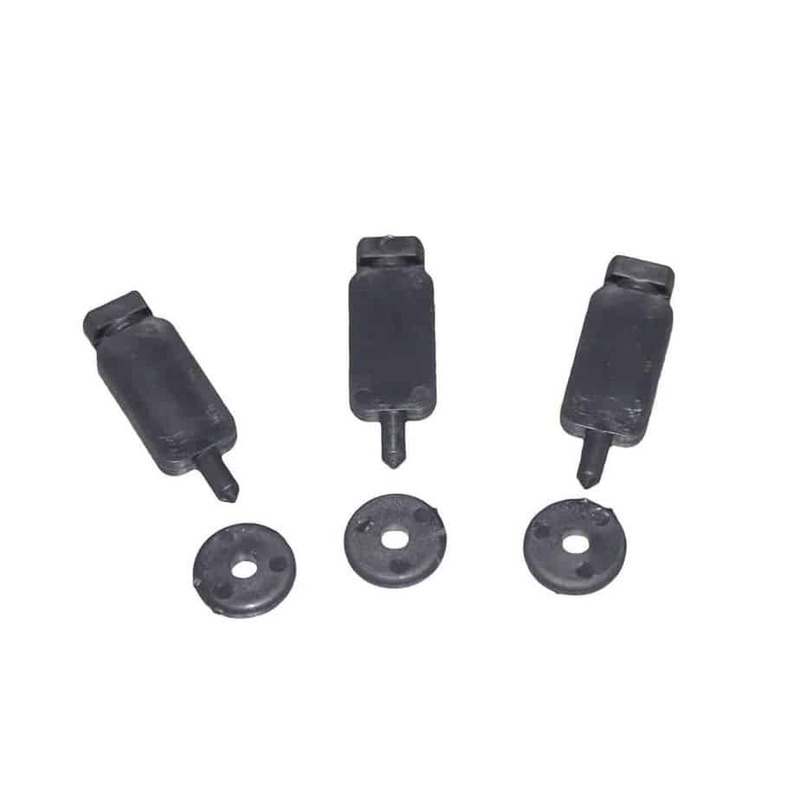 These are ideal for most place around your home, garage, workshop, warehouse, shed and a whole host of other applications. All the led tubes and fittings are compatible so no editing of fittings would be needed. a 2kW will heat up to an 8x12 greenhouse, possibly a little bigger if you only want it frost free. If you are pushing the borderline with this, then take extra measures during a very cold snap (e.g -10 at night) such as adding more heat or turning the thermostat up to allow a bigger buffer during the coldest part of the night.